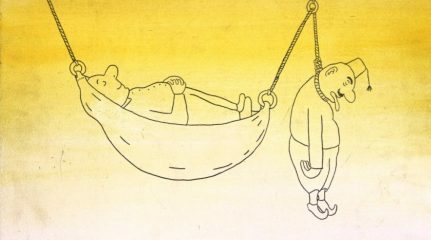 Dudu Geva (1950-2005) was an Israeli artist, caricaturist, comics artist, illustrator and satirist. Over the years, he published satirical comics and humoristic columns in the press, many of which were also published in his multiple books. During the last years of his life, Geva was also active outside the sphere of mainstream press, as an alternative comics and underground culture activist. Geva was not only a journalist and writer, but also an artist – both professionally and as a hobby. 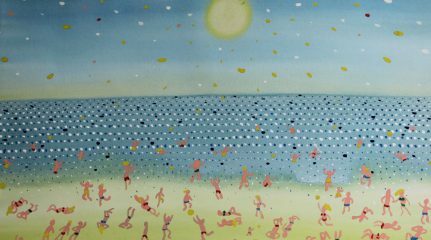 His multiple paintings include a collection of aquarelles, acrylics, pastels, and pencil-and-pen drawings, reflective of a highly diverse experimentation (from classical drawing to comics), styles (mainly line, image and color styles), gestures (from impressionists to Donald Duck) and global cultural influences. Dudu died at the young age of 53. But his oeuvre is an artistic lifetime. 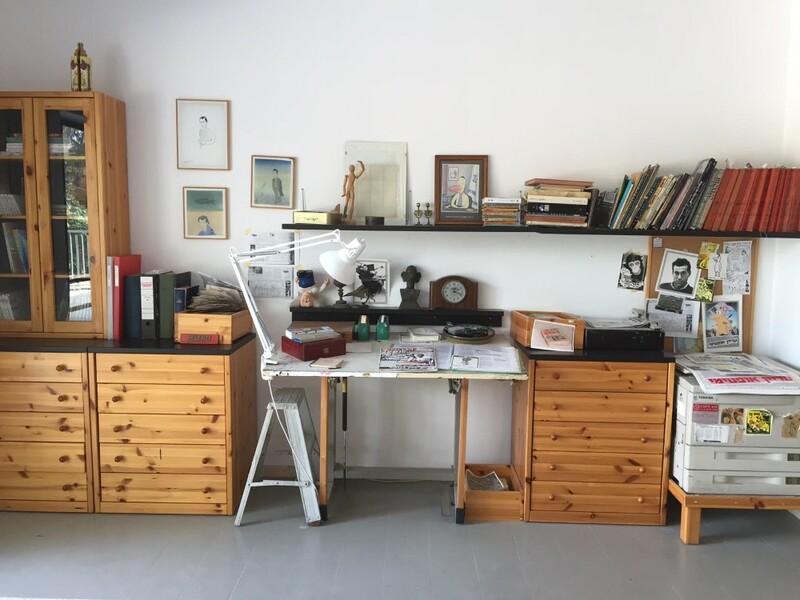 In February 2013, on the eighth anniversary of his passing, the Mishkan Museum of Art inaugurated the artist’s reconstructed studio: the collection of his works, his library and tools (desk, photocopier and light table) were transferred to the museum and placed as an integral part of the active workshop that bears his name – The Dudu Geva Studio, designed by Yael Reshef who had worked with him as a graphic designer in the Maariv daily newspaper. The cabinets and drawers are full of books published by Geva, many of which are long out of print. Visitors to the studio can also view unpublished works as well as animation and other films by the artist. His collection stored in the museum includes some 1350 works. The studio touches on the rich tapestry of paradoxes and shades of character that together comprised the complete artist Dudu Geva was. Together with works for the press and television, it was important for Dudu to create independent, non-commissioned artworks, created in his endless search for freedom. Some of these paintings hang on the studio walls. After a long period of being a devoted fan, I was fortunate to meet Dudu personally when working in the now defunct Hadashot daily, and later, in Maariv, I worked with him in his small and intimate studio. He created, and I executed his works on the computer. Working with Dudu taught me that the comic strips, sketches and paintings did not betray the meticulous work invested in them. Every tiny detail was calculated. The gracefulness of the line and the simplicity of the composition were achieved through hard work. Nothing was left to chance. 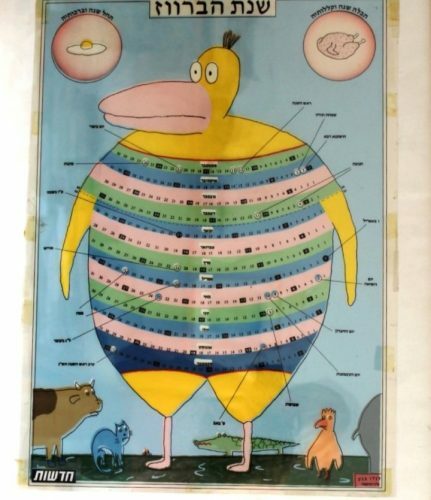 The thickness of the line, the relative size of the graphics and text, the color scale, the tiny “trespasses” when the drawing overreached the frame, the font – everything was tested, scrutinized and corrected until he was satisfied. Dudu was a hardworking man and an early riser. He acceded gladly to every urgent request by an editor, even if it was in the middle of the night of in the weekend. He was a laborer-artist, an artist-laborer. In his dreams, he would see Van Gogh, and he had a powerful yearning for the romantic aspect of art, but when he woke up, the values of work would prevail. Dudu articulated his sociopolitical views in both his works and in grassroots activism. He treated the newspaper column as seriously as he treated the protest demonstration or any voluntary activity. He never rested. The need to fight was in his bones. The Dudu Geva memorial studio is a living testimony of an energetic and political artist who used line and dot, paint and font to express his views until he breathed his last.